I’ve been feeling all alone in Thailand. Far, far away from the ones I love and I have definitely been having some trouble coping. Despite the trouble I’ve had with adjusting to my new life in Thailand I knew that a beautiful beach would help that. I jumped on the bus to Surat Thani (the place where the lady yelled at me about my window being open) and caught a bus to Krabi. When I got into town, there were no normal taxis, only motorcycle taxis. Something I have never endeavored. Well I did. And as the wind whipped into my face, I made a promise to myself to fully enjoy where I am. To embrace my “solitude.” I found a hotel and as I was checking in, I met Katja from Germany. She was traveling on holiday for a few weeks and we became instant friends. While grabbing a drink at Chokdee restaurant in Krabi Town, we started perusing the possible day trips that Krabi had to offer. Because we both had a strong hankering for beautiful beaches, we decided to book an island hopping tour together for the next day. We joined the 4 island tour group and embarked on a day full of sun, snorkeling, swimming, and chatting. It was amazing to have such a great person to experience the beautiful islands of Krabi. 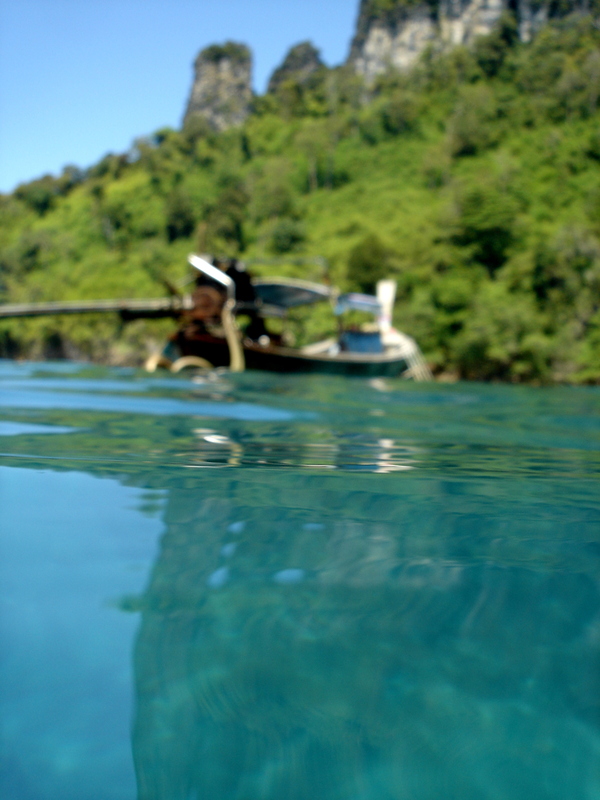 Our first stop was at Poda Island where we had a quick photo shoot with a perfectly placed Longtail boat. Once we started snapping photos, a more people decided that it was a picture worth taking and started crowding around. We then took a snorkeling trip at Chicken Island. We didn’t see anything too out of the ordinary, but it was my first taste of snorkeling in Thailand so that was exciting. When trying to juggle my underwater camera I dropped my snorkel and because I was wearing a life jacket I was unable to grab it before it slowly floated to the bottom. I panicked because it was 1,500 baht to replace them (a little excessive I think) and I convinced an Israeli man to dive down and retrieve it for me. Super nice of him, especially since we hadn’t spoken on the trip yet. Our next stop was Tup island, which was absolutely gorgeous. It is connected with the other side of Chicken island by a long sand bar and it is extremely picturesque. Definitely a beach that I pictured when I thought of Thailand. 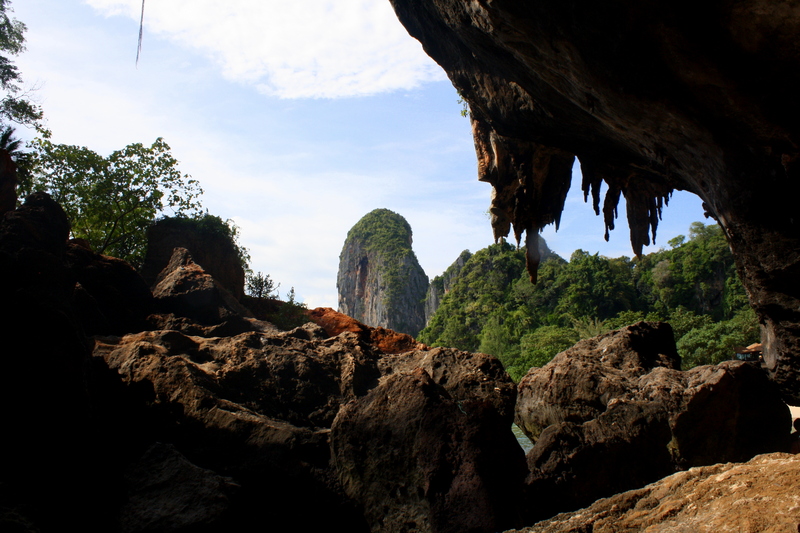 We had lunch there and lounged about in the sun before we made our last stop of the day, Phra Nang Cave on Railay Beach. Railay Beach was beautiful, but very crowded. Phra Nang cave is definitely worth a look and good for a few pictures, but it doesn’t go anywhere, so what you see is what you get. It might be a great place to visit early in the morning when everyone is still sleeping off their hangover from the night before! The day was exhausting, but absolutely completely worth it. I wanted to book another one for the next day, but because Katja is a fair, German, who doesn’t see the sun much, her bright red sunburn stood in the way of us spending another blissful day in the sun together. So without my new friend, I booked another island tour (Five Islands, also known as the Hong Island Tour this time), and went at it alone. The Five Islands tour is a little deceiving. I’m pretty sure we didn’t see five islands. I don’t even think we saw four islands, but the main island we did see, Hong island, was my favorite island by far. We explored a beautiful lagoon on the island and then spent two hours basking in the sunlight, snorkeling, relaxing, and just enjoying the wondrous day. We did a drive by of another island that was supposed to be on the tour, but somehow conveniently we couldn’t land because the tide had changed. We also stopped on Lading Island, where we were supposed to snorkel, but the water was so shallow I didn’t feel comfortable floating an inch above coral (I’m pretty sure that’s how people come back with big gashes in their legs). I love being on tropical islands!! My trip to Krabi was awesome, but its definitely hard to be alone sometimes, and I know that I have a lot more where that came from! But one thing I do know is that I will be coming back to Krabi. Rock climbing in Railay next time. Ko Phi Phi another. And much much more! Great pictures – especially the one of the boat! Sounds like great fun, I haven’t broken out of Europe yet , so much to do there first. Good blog, I enjoy it. Oh this makes me long to return to Thailand. I’ve done this trip and it really is something special as is Railay. 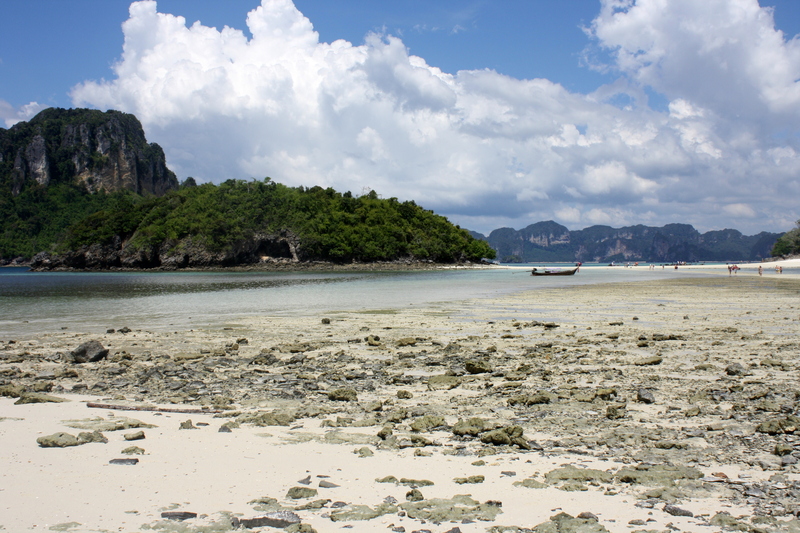 Krabi’s my favourite part of Thailand – be sure to spend some quality time there. I look forward to reading about the Hong Islands tour. I went on it already when I was there!! The picture of my feet is when I’m on Hong Island!! The tour was pretty much a tour of Hong Island. It took an hour to get there so we spent a lot of time in the boat and spent a couple hours on the island. We didn’t do as much “hopping” as the four island tour! Oh sorry, read it wrong! The Hong Island pic looked like Phra Nang beach in front of Rayavdee. I’m with you now though. Did the tours include Bamboo Island too? I remember it being really deserted and the sea off it to be an incredible variety of shades of blue. Enjoy! Bamboo Island is on The Phi Phi islands tour which hopefully I’m going to go on in the next couple weeks or so! I’ll let you know how it is! !